Below are a selection of sample mission statements from a variety of charities and non-profit organisations. As you will see they vary from 1 or 2 tight neat sentences to more elaborate missions and visions. 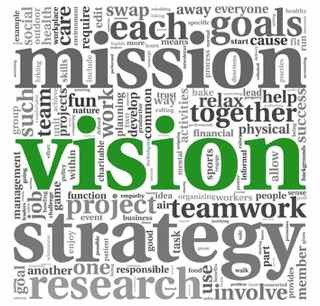 The important thing is that your mission statement should be relevant, succinct and work for your group. To facilitate the rehoming of unowned cats and kittens nationally through cat rescue groups, and to promote kindness to all animals." Educate the public about the desirability of adopting Italian Greyhounds as companions and family pets in the home. Facilitate placing Italian Greyhounds in loving, responsible, forever homes. Provide continuing educational support to the Italian Greyhound family after placement to ensure a successful adoption. Support, welcome, and encourage an active, organized volunteer base of Italian Greyhound lovers who share the passion and vision of finding loving, responsible, forever homes for Italian Greyhounds to live out their natural lives. Stress the importance of spay and neuter as a means of controlling the number of unwanted animals. Connect with other groups and people that assist and adopt Italian Greyhounds to promote adoption worldwide. Enjoy the spiritual connection we all share with Italian Greyhounds and each other in loving and helping one of the most loving and loyal creatures put on this earth. Main Line Animal Rescue specializes in the rescue and placement of abused, unwanted and abandoned companion animals. We never discriminate on the basis of health, age or breed. By involving and educating the community, Main Line Animal Rescue works to raise the public's awareness of the plight of homeless animals as well as realizing the benefits of adopting an animal in need. Our animals are examined, vaccinated, spayed or neutered and receive any and all medical treatment before they are placed in carefully screened homes. The Saints Youth Centre provides an environment where young people can learn and practice leadership skills and focus on ethical decision making. The Saints Youth Centre is able to reach at-risk young people and offer much needed care and support. For these aspirations to become reality however, it is essential that the youth centre is seen to be firmly rooted within the life of the wider parish community, and that wherever possible, young people are provided with the opportunity to participate in the life of that parish community.Through the programmes, activities and ethos of the centre, the leaders guide and support young people and act as mentors and role models in their personal, social and spiritual development. The programmes that the centre provides will create opportunity for the young people to develop into mature and responsible adults who will play an important role within their communities and wider society. As parish youth workers based in Holy Family Youth Centre, we will work to create appropriate settings that facilitate the growth and development of the young people of Holy Family Parish and surrounding areas. We will work in partnership with young people as they seek to meet their political, social, personal, cultural, spiritual and physical needs. In working to achieve these aims we will strive to create a climate of mutual respect understanding, equity, diversity and interdependence. The Gazelle Trust provides essential financial and material assistance, in terms of education, shelter and healthcare, to orphans and vulnerable children in developing countries. Toybox is a Christian charity committed to helping street living and street working children and those at risk of becoming so, principally in Latin America.Our vision is of a world where there are no street children, where families are restored, those who are disadvantaged have choices and hope and all children have a voice.Our mission is to bring lasting and positive change to the lives of street children, street working children and those at risk of becoming so, through front line work, prevention and advocacy, being a facilitator and enabler, galvanising people and resources in the UK, Latin America and worldwide. Muslim Charity is a leading international relief and development charity which works to alleviate human suffering around the world. Established in 1999 we are an independent NGO and provide aid and assistance to the most needy throughout the world. Motivated by our faith in Islam, Muslim Charity serves alongside the poor and impoverished as a demonstration of Allah Almighty’s unconditional love for all people. Muslim Charity serves all people regardless of race, religion or gender. The mission of North Point Community Church is "Our mission is to lead people into a growing relationship with Jesus Christ. We accomplish our mission by creating environments where people are encouraged and equipped to pursue intimacy with God, community with insiders, and influence with outsiders. "To this end, North Point strives to accomplish its mission by creating irresistible environments led by skilled staff and volunteers. Offering a welcome to any who wish to join us in worship or other activities. Supporting members of the Church family and creating opportunities to study and pray together. Helping people to learn about and develop their own faith and encouraging them to enter Church membership. Ensuring that all aspects of Church life reflects its open policy and make provision for all ages. Working with our Christian neighbours in other local Churches, the wider Church family in the Shrewsbury and Marches Circuit and throughout the world. The mission of the Sage Canyon PTA is to promote the social, emotional and educational development of our students and to encourage parent volunteerism and community involvement in our school. To bring in closer relation the home and the school, that parents and teachers may cooperate intelligently in the education of children and youth. Fearn Elementary School PTA is dedicated to enriching and supporting the lives of children, parents and educators. We do this by providing resources, communication and encouraging involvement in the school and community. sharing information on issues that impact our children.It is our belief that the team effort of a parent teacher organization offers the best possible learning environment for our children. The International Committee of the Red Cross (ICRC) is an impartial, neutral and independent organization whose exclusively humanitarian mission is to protect the lives and dignity of victims of armed conflict and other situations of violence and to provide them with assistance.The ICRC also endeavours to prevent suffering by promoting and strengthening humanitarian law and universal humanitarian principles.Established in 1863, the ICRC is at the origin of the Geneva Conventions and the International Red Cross and Red Crescent Movement. It directs and coordinates the international activities conducted by the Movement in armed conflicts and other situations of violence. The primary goal of the Center is to prevent the unnecessary institutionalization of people with autism and to help people with autism achieve their highest level of independence within their home, school and community. Aims - To empower its users with a better knowledge and understanding of their illness so they can make more informed choices about their treatment and future.To assist its users through education, recreation and information, to make healthier choices and to encourage them to take responsibility for their own recovery and future well-being.To help its users to come to terms with their diagnosis in a positive way and assist them to move on.To promote patient participation within our Health Service. Contributing to the rebuilding and refurbishment of the hospital. We are committed to helping build lasting health services which are used and championed by everyone.We are specialists in both rapid medical response and health service rebuilding, effectively taking countries from emergency to recovery.We are undaunted by the challenges of providing health care to vulnerable people living in the most difficult, forgotten corners of the world.We are determined to campaign to make health a global priority; giving people caught up in conflict, disaster and health system collapse the chance to lead healthy lives.We care. For people at risk, for the lives we hope always to save, for the safety of our staff. We care about being accountable to our patients, partners, supporters and donors. And we care about keeping our promise: to stay on, beyond the crisis, for as long as we are needed. Angelwish.org was created in 1999 with the mission to provide the public with an easy way to grant wishes to the millions of children that are living with HIV/AIDS around the world. Infected or affected by the disease, their opportunities for a "normal" childhood are virtually impossible. By harnessing the power of the Internet, Angelwish helps donors add a ray of hope to their lives. In 2010, after 10 years of focusing on HIV/AIDS, Angelwish expanded its mission to include children living with chronic illnesses such as Asthma, Diabetes and Kidney Disease. Angelwish achieves its mission by ensuring that 100% of individual donations are used for program services and that those funds are extended, where possible, to incorporate an educational component giving young people a hands on lesson in philanthropy. To raise awareness, in the UK and elsewhere, of the need for conservation, to improve understanding and generate support through education, information and fundraising. Working with media organisations and charities to enhance their communications and enable communities to find their voice and make it heard. Ready to write your own? 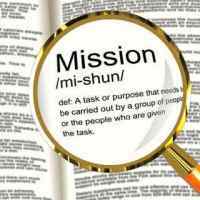 Does your group have a mission statement to be proud of?